Office 365 Cloud App Security gives you insight into suspicious activity in Office 365 so you can investigate situations that are potentially problematic and, if needed, take action to address security issues. 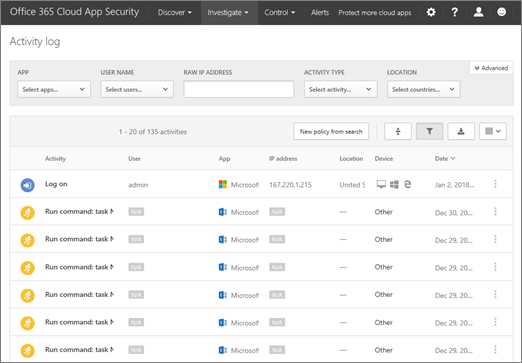 With Office 365 Cloud App Security, you can receive notifications of triggered alerts for atypical or suspicious activities, see how your organization's data in Office 365 is accessed and used, suspend user accounts exhibiting suspicious activity, and require users to log back in to Office 365 apps after an alert has been triggered. Read this article to get an overview of Office 365 Cloud App Security features and capabilities. To access the Office 365 Cloud App Security portal, you must be an Office 365 global administrator, security administrator, or security reader. To learn more, see Permissions in the Office 365 Security & Compliance Center. You can get to the Office 365 Cloud App Security portal by going to https://portal.cloudappsecurity.com and signing in. In the Security & Compliance Center, choose Alerts > Manage advanced alerts. 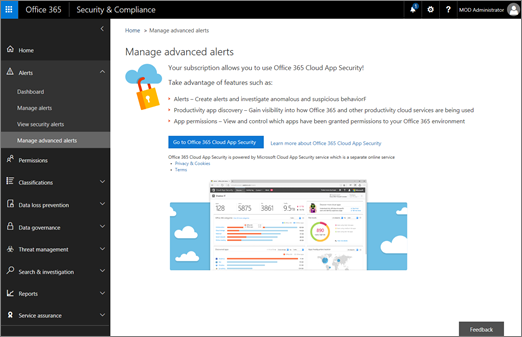 Office 365 Cloud App Security works with the policies that are defined for your organization. 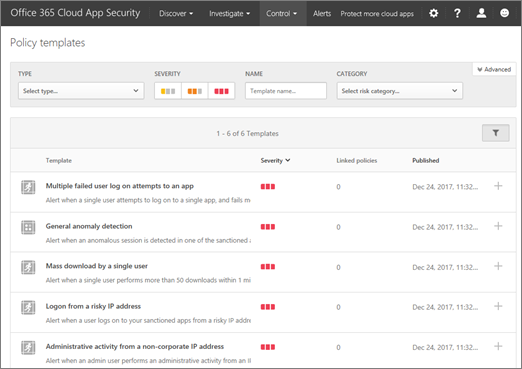 With Office 365 Cloud App Security, your organization gets many predefined anomaly detection policies and several templates for activity policies. These policies are designed to detect general anomalies, identify users logging in from a risky IP address, detect ransomware activities, detect administrator activities from non-corporate IP addresses, and more. To view/use policy templates, in the Office 365 Cloud App Security portal, go to Control > Templates. When policies are defined, alerts notify you about suspicious or atypical activities that were detected. To view alerts for your organization, choose Alerts in the navigation bar across the top of the screen. As alerts are triggered you can review them to learn more about what is going on. Then, if the activity is still suspicious, you can take action. For example, you can notify a user about an issue, suspend a user from signing in to Office 365, or require a user to sign back in to Office 365 apps. View information about user activities on your Activity log page in Office 365 Cloud App Security. To get to this page, in the Office 365 Cloud App Security portal, go to Investigate > Activity log. 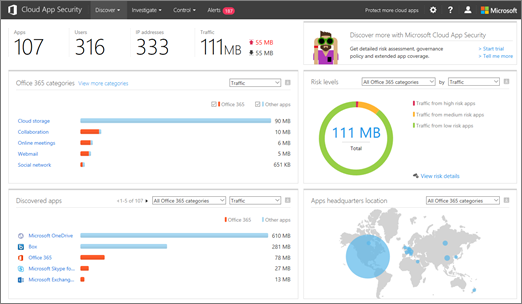 You can use your web traffic logs with Office 365 Cloud App Security, too. The more details that are included in those log files, the better visibility you'll have into user activity. You can use log files from Barracuda, Blue Coat, Check Point, Cisco, Clavister, Dell SonicWALL, Fortinet, Juniper, McAfee, Microsoft, Palo Alto, Sophos, Squid, Websence, Zscaler, and more. With Office 365 Cloud App Security, you can allow or prevent people in your organization to use third-party apps that access data in Office 365. To get to this page, go to Investigate > OAuth apps. To get to this dashboard, in the Office 365 Cloud App Security portal, go to Discover > Cloud Discovery dashboard.